What does dementia and a child's toy have in common? What does dementia and a child’s toy have in common? Home/Dementia Friendly/What does dementia and a child’s toy have in common? Have you ever experienced, once you get one thing in place that something else shifts? That every time you do something right, it has also caused something to go wrong? That’s what it feels like to live with dementia. Using a small children’s toy, I gave a visual demonstration of what living with dementia is like, in front of an audience at a conference. 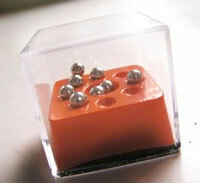 The toy was a small piece of plastic with several silver balls that you needed to roll into indents. The difficult part about this was that every time a ball rolled into an indent, another one jump out. Every time you think you get close to getting all the balls in, some would pop out. Two steps forward, one step back. It’s a simple task but very difficult to accomplish which is something people with a dementia struggle with daily. Tasks they have always easily accomplished, they now struggle with. As I watched, people that came up on stage and played with the toy began to get frustrated as they approached success because another ball would jump out. Every time they got frustrated it became harder and harder to complete this simple task. This however is where the two differ; a person playing with this toy, with enough patience and determination will eventually be able to make the balls sit in the puzzle. People with a dementia aren’t as agile. People living with dementia have difficulty making all the pieces fit causing them to become frustrated. This is why experienced Caregivers are paramount. Their compassion, patience and loving nature can break through the cycle of stress and frustration. Their qualifications and knowledge can make tasks easier and achievable, bringing out the positives for people living with dementia. Learning about dementia and openly understanding the condition can provide an immense difference to the life of someone with a dementia. Daughterly Care continues to aim and grow their knowledge of dementia. Our Caregivers regularly update their training and apply this knowledge to the many dementia care recipients they engage with. Our Caregivers are passionate about our dementia care recipients therefore, they go above and beyond the standard care duties. They know how to appropriately engage with the dementia care recipient and, nurture their abilities and strengths so they can continue to live how they want, joyfully. In the comment area below, leave a message on how learning about dementia has enriched your life and others. It is difficult for the clients and their families to understand and accept the progression of dementia and the gradual loss of ability to function normally and independently as well as slowly losing the person they love, their personality and their relationship with them. No matter how hard the client and family members try. BUT WITH UNDERSTANDING AND ACCEPTANCE you can make this journey for both parties less stressful, and more enjoyable. I love working with dementia clients and being able to ease their confusion, frustrations and fears. As there is still so much to enjoy about a person with dementia, it’s just different. With patience and taking time to implement strategies is very rewarding, NOT EASY, but WORTHWHILE. Thanks for your lovely comments Eleanor. You make a good point, the person is just different. When we can appreciate the person they are now we can enjoy the moment with them rather than mourning the past. Great initiative and community awareness that this subject is not lost via keeping the community continually informed. Thanks.